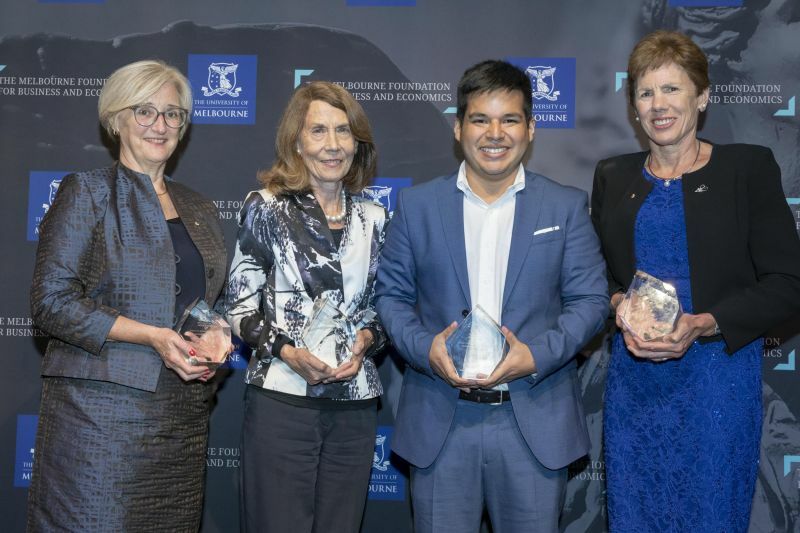 Four outstanding alumni were celebrated at the 2019 Melbourne Foundation for Business and Economics Dinner at the National Gallery of Victoria. Every year, we acknowledge the leaders and trail blazers in our alumni community with our Alumni of Distinction Awards. This year’s four recipients have all taken varied paths to reach great heights of success. Selected from a community of over 57,000 alumni worldwide, these recipients join an esteemed group of previous Alumni of Distinction awardees and exemplify the Faculty’s aspiration to educate leaders who make a global difference in business and the wider community. Fernando Tamayo (BCom, 2010) was the recipient of this year’s Rising Star Award for Young Alumni. Peruvian-native Tamayo is a natural entrepreneur with a strong social conscience. 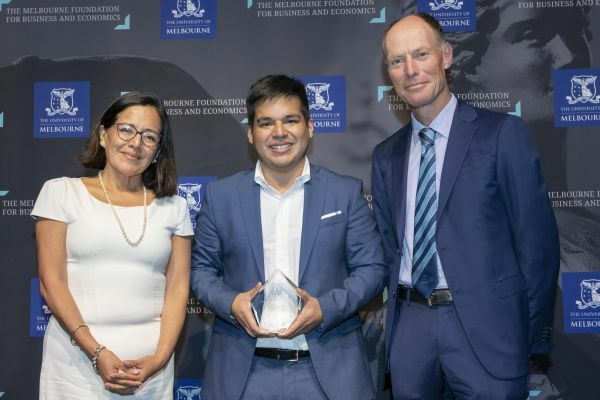 While studying at the University of Melbourne he founded the Melbourne Microfinance Initiative (MMI), a student-run consultancy committed to improving the lives of underprivileged communities. Fernando Tamayo with his mother and Faculty of Business and Economics Dean, Professor Paul Kofman. In 2013, he founded YAQUA, a social enterprise that sells bottled water and transfers 100 per cent of the profits towards implementing clean water projects in the most vulnerable communities of Peru. Tamayo credits his time at the University launching MMI for his current success. “I think launching MMI was one of the best experiences of my life. It was where I learned what I really wanted to do, and what my capabilities are. It gave me a sense of possibility. Without MMI I wouldn’t have started YAQUA. I don’t think I would have been able to convince myself I was capable of that.” he said. 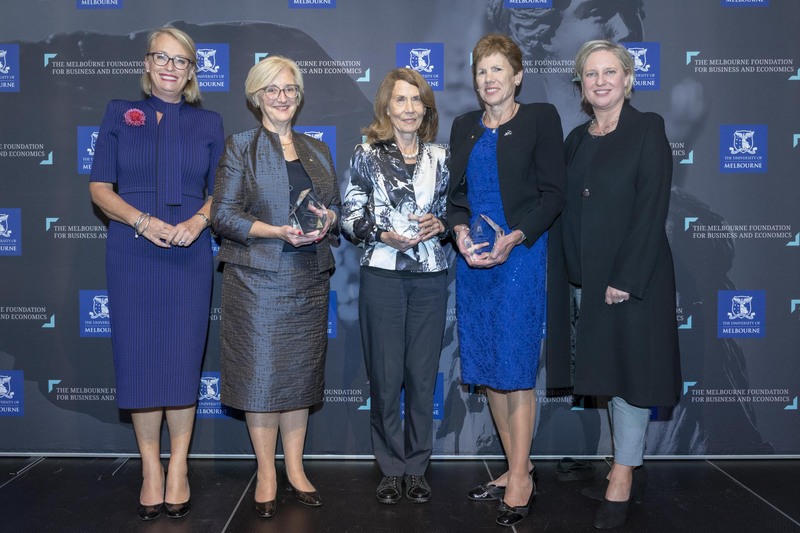 This year’s Leadership and Outstanding Achievement Awardees were women who have had considerable impact on business and policy over the course of their careers. Outstanding Achievement recipient, Elizabeth Alexander AM (BCom, 1964), and Leadership Awardee, Janet West AM (BCom, 1974), were two of the first female leaders in the accounting and consulting worlds. Alexander was the first woman appointed partner of a ‘Big Eight’ accounting firm in Australia (PwC) and West was Deloitte’s first. Alexander was the 21st Chancellor of the University of Melbourne. West, Alexander and Dr Williams with Faculty Board Member and Lord Mayor of Melbourne, Sally Capp, and outgoing Chair of the Business and Economics Alumni Council, Larisa Moran. “Until I became a partner at Deloitte, I wasn’t aware how unique it was – to be a woman in the high ranks of leadership. There were a number of female employees and some middle managers at Deloitte, but it was a different story at the top. I remember at my very first national partners meeting, I was the one woman in room of a hundred men,” West said. Dr Lynne Williams AM (BA (Hons) 1973 and MA 1976) received the Faculty Award for extensive and continued contributions to the governance of the University through membership of the boards of the Faculty of Business and Economics and Melbourne University Sport; she has also been a Fellow of St Hilda’s College since 1997 and Principle Fellow since 2018. Dr Williams was also recognised for her achievements as a senior economist and executive in the public sector for over 30 years. “Education, broadly defined, is a vital enabler that has helped each of us make a difference in our own ways. We all loved our time at the University and have continued to remain involved in different ways,” Dr Williams said. All three women continue to contribute to businesses, government and the community through their leadership positions on various boards and committees including the Institute of Public Administration Australia, Medibank Private and the Red Cross. When it comes to defining what makes someone a good leader, West says the answer is simple. Fernando Tamayo (BCom 2010) Fernando Tamayo is an emerging leader in Peru and the Latin America region, who is recognised for promoting sustainable development through social enterprise. Fernando is the founder and CEO of YAQUA, the first social enterprise in Peru that transfers 100% of its profits towards implementing sustainable solutions to the water crisis his country is facing. Dr Lynne Williams AM (BA (Hons) 1973 and MA 1976) (MsC London 1977 and PhD Monash 1980) Dr Williams was a senior economist and senior executive in the Victorian and Australian public service for over 30 years. In 2017, Dr Williams was appointed as a Member of the Order of Australia for her significant service to public sector administration, and to economic and public policy reform in Victoria. She currently sits on several boards at both Commonwealth and state levels and is a Fellow of the Institute of Public Administration Australia. Janet West AM (BCom, 1974) Janet West AM is a non-executive director with experience in public sector, community and private organisations. Her professional background is as a Chartered Accountant with 23 years as a partner of Deloitte, specialising in audit. She was also the first female President of the Institute of Chartered Accountants, now Chartered Accountants Australia and New Zealand (CAANZ) and has led a number of programs to support the advancement and retention of women in Chartered Accountancy and business more generally. She held the position, National Leader, Professional Standards Review for three years until her retirement in December 2011. Elizabeth Alexander AM (BCom, 1964) Former Chancellor at the University of Melbourne and current Chairman at Medibank Private, Elizabeth Alexander has demonstrated outstanding passion and leadership throughout her distinguished career in the accounting profession. She has been dedicated to empowering businesswomen and continues to provide an extensive and active contribution to the industry. She has been a pioneer breaking new ground in accounting as the first female partner in a 'Big 8' accounting firm. She was also the first female State and National President of CPA Australia. Elizabeth is one of only two female Life Members of CPA Australia. Find out how you can nominate yourself or someone else for an Alumni of Distinction Award.